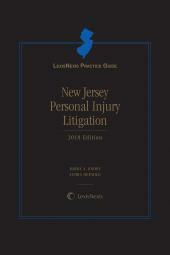 LexisNexis Practice Guide: New Jersey Personal Injury Litigation provides in-depth procedural and substantive coverage of the causes of action central to New Jersey personal injury practice. In LexisNexis Practice Guide New Jersey Personal Injury Litigation, General Editors Barry A. Knopf and Audra DePaolo have assembled a distinguished group of expert authors to provide in-depth procedural and substantive coverage of the causes of action central to New Jersey personal injury practice. Combining a task-based, procedural style with substantive analysis, and practical insight based on years of practice experience, LexisNexis Practice Guide New Jersey Personal Injury Litigation is a unique source for the attorney unfamiliar with the practice area, the associate in need of an authoritative source, or the solo or small law firm practitioner needing reliable guidance in managing a personal injury case from the initial interview through trial. Each Practice Guide chapter combines authoritative legal analysis with expert authors' practical insights that have been distilled from years of practice experience. LexisNexis Practice Guide New Jersey Personal Injury Litigation includes more than 150 Practice Tips--Strategic Point, Warning, Timing, and Exception (with easy-to-recognize icons)--that transition smoothly from legal analysis to practical application of a point of law. 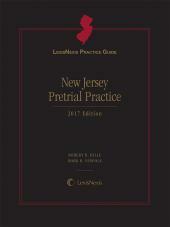 LexisNexis Practice Guide New Jersey Personal Injury Litigation includes more than 100 forms references in checklists and in chapter text. Fillable, downloadable forms are included in the online subscription to this product. Barry A. Knopf is a partner in the law firm of Cohn Lifland Pearlman Herrmann & Knopf LLP in Saddle Brook, New Jersey, where he litigates personal injury actions, including medical and legal malpractice cases. He also serves as an expert for parties involved in legal malpractice actions. Mr. Knopf has been certified as a civil trial attorney by the New Jersey Supreme Court since 1982. Mr. Knopf has been involved in a number of reported decisions and is co-author of the chapter entitled Drugs and Medical Devices: The Unavoidably Unsafe Products, New Jersey Product Liability Law, New Jersey Law Journal Books, 1995, as well as Professional Negligence--Malpractice Law in New Jersey, Institute for Continuing Legal Education, 1981 (2nd ed. 1985) (3rd ed. 1990) (4th ed. 1996). He is a member of the adjunct faculty of Hofstra University School of Law's Trial Advocacy Program, a frequent lecturer for the New Jersey Institute for Continuing Legal Education and serves as a Master for the Morris Pashman Inn of Court since 1998. Audra DePaolo is a partner in the law firm of Cohn Lifland Pearlman Herrmann & Knopf LLP in Saddle Brook, New Jersey, where she practices in the areas of appeals, civil litigation and estate and probate litigation. Before joining the firm, she served a judicial clerkship with the Honorable Peter Ciolino, A.J.S.C. in Bergen County. Ms. DePaolo is admitted to practice law in both New Jersey and New York. She is a member of the New Jersey State Bar Association and the Bergen County Bar Association. 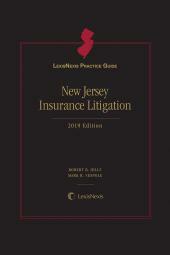 Ms. DePaolo has been involved in a number of reported decisions, and she co-authored the articles, “McDougall v. Lamm: New Jersey Supreme Court Ruling that Emotional Distress Damages Are Not Available for Witnessing Death of Beloved Pet Keeps Man’s Best Friend in the Dog House,” 2012 LexisNexis Emerging Issues 6645 (September 2012) and “Federal Court in Bashir v. The Home Depot Slices Lessor’s Defense under NJPLA in Stump Grinder Case,” 2011 LexisNexis Emerging Issues 6153 (December 2011).